I was immediately pulled in to this fascinating world, right from the first page. We’re first introduced to Eve, the mother of two children, one who has a rare condition that doesn’t allow him to be in any UV light. If you didn’t read the back synopsis, you wouldn’t necessarily know that, just that there’s something a little off about the Birthday party she is setting up for. It soon becomes clear that organizing everything at night is normal for Eve. Just reading about how these characters cope with Tyler’s condition is fascinating. There are so many things that we take for granted that Tyler has never been exposed to. Simple things like neighbor etiquette and personal space. Tyler spends most of his time alone, locked up in his room and away from the light. I had almost forgotten that the book wasn’t just about Tyler’s experience with XP, the shortened name for his condition, when a new tragedy hits the family. It was completely unexpected and more heart wrenching than I had anticipated. I was consumed with this book. I hated putting it down because I needed to know how it ended. I was so mad at Eve most of the time. I thought she handled everything completely wrong, but then we wouldn’t have had a story so I guess that’s a good thing. But I needed to know how it would resolve itself even though I didn’t think it would be possible to resolve the mess that Eve created. It’s a big one. I love the way that Buckley enfolds the story. There are so many times when Eve questioned what really happened and you, as a reader, will also question it. There are hints that maybe it didn’t quite happen that way, maybe she was wrong, but she couldn’t possibly be wrong. When everything finally comes out, it’s a relief. I loved everything about this book except for how fast everything wrapped up. The very last chapter kind of puts a little bow on everything and I was sad about that. I think maybe the author thought it was long enough and didn’t want to put any more length on it, but as a reader I felt I had already invested all this time and I would have liked a little bit more to help myself feel the closure that one of the characters felt at the end. It’s not enough to lower a rating on the book. I would still consider it a five star book. 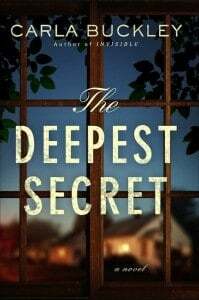 Check out the other reviews of The Deepest Secret by Carla Buckley. I just finished reading it and your review is spot on….I really enjoyed the book! This book sounds wonderful. I’ll finish my entry at home. My daughter’s computer is limiting me on what I can do. Thanks fore this awesome giveaway. This book sounds great. Would love to win a copy. Thank you for offering this give away. I’m intrigued by Eve and Tyler and all these secrets – can’t wait to read this one!